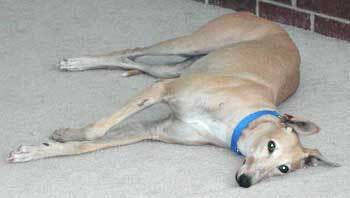 Taffy, aka Salt Water Taffy, is a 7-year-old sweet, calm and quiet light-fawn female. 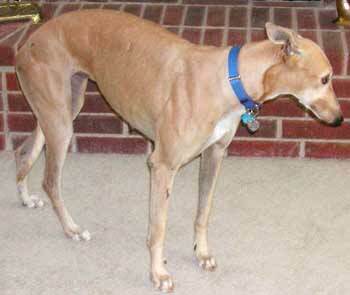 She was found as a stray south of the DFW area, and was rescued from being euthanized by a matter of only two hours. When she was found, along with a female rottie, her owners were traced from her tags, but they said they didn't want either one of them anymore. She is completely house and crate trained. She loves to be around other dogs, and enjoys getting human attention. She likes going for long rides, running around the yard, going for a walk, getting treats and being hugged, and if you forget she will remind you with a bark or two. She loves to cuddle up on her big comforter and watch the action around her. Most of her time is spent observing her surroundings and looking up at you with her big, brown eyes. 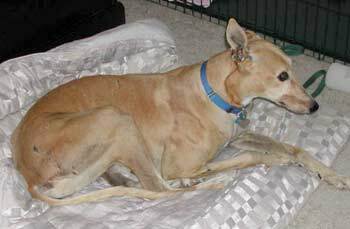 Taffy needs a home who will love her for the rest of her life. You've never seen such BIG, Beautiful, Brown Eyes!